Before I bought this record, I left it standing in the shop for months and months. I didn't think it would contain longer versions of the two songs listed, and that was reason enough not to buy it. I think I was right, because when I finally did buy it, this record contained the regular versions of the songs. Still, after all that time, the price had dropped, so the financial damage was limited. 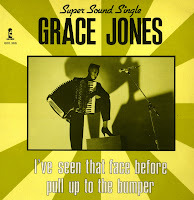 Grace Jones is an icon, and 'I've seen that face before' is her best song, in my opinion at least. If only for that one line: 'toi aussi, tu déteste la vie'. There's only one woman who can snarl like that.